Front facing design is very nice. Admin however is horrible. 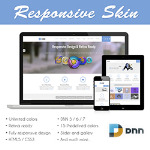 Very difficult to edit this skin if you are not a programmer.. Not suitable for DNN 8 or 9 if you plan to import the demo site. Support has been completely non-responsive. All I expected and more. Great examples, very easy to install. Great support, the vendor fix my bug request within less than 48 hours. 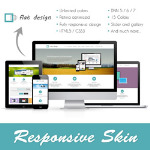 This is a great looking responsive skin with lots of jQuery design extras loaded and examples ready to modify for your own use. Files are well organized for additional custom work. Great Skin! Great Support! Do not esitate to buy it! Very capable and easy-to-use skin. This has a great balance of newest design techniques using good platforms like Bootstrap, while at the same time not over doing it with complex features you probably will never use. Highly recommend. Support has been used once and response by email fixed my issue in less than a day. Just bought this skin and I have to say it's one of the best I've purchased. 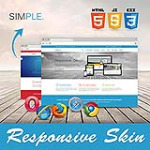 The developer has well detailed instructions about the skin on demo and it's nice to reference as I develop my new site. Highly recommend!